Well, hello there. Looks like the B@ker Blog took a bit of a summer vacation. Once again, busyness has taken over, and at the end of each quick day, I am too worn out (lazy...?) to post! Here we are a week after a stressful week, with another...stressful week. On Monday, the week started off with me (and Mark, I'm sure) already feeling a bit beaten down from the events to move Cam. Still, we were excited for him to start his new job, and were really looking forward to hearing about his first day. Well....it was terrible. As described by him, he went in, spent an hour with his boss, and was then told "Ok, go do your stuff." He had no idea what he was doing and did not know what to do. He was upset, feeling lost and unqualified, and felt like he couldn't even go back the next day. Uh oh. 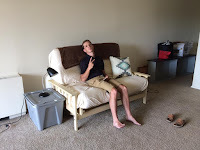 I tried to calm him down, and let him know that quitting after one day, or even several days, is not an option for a whole host of reasons, among them that we did not have the $$ to move him back and he had signed a year lease. Then Monday night, he saw a mouse in his apartment. I'm pretty sure that ranked as on of the worst days of his life (so far! ).